Would More Speed Separate The Pros From The Amateurs In Endurance Racing? No. 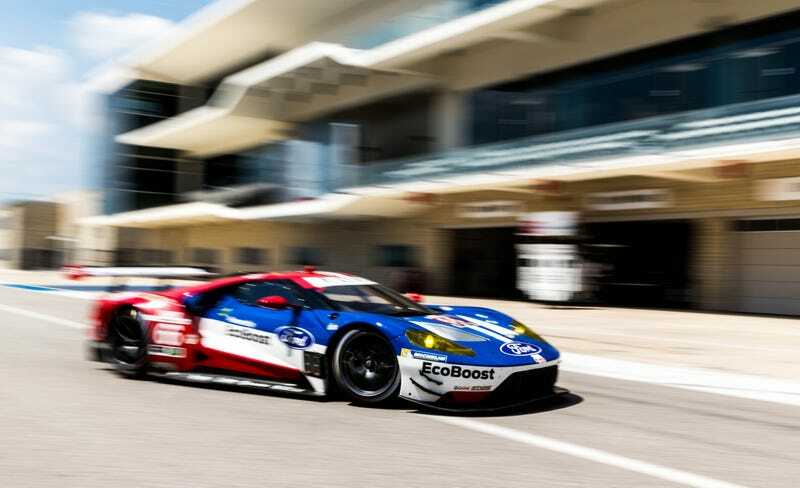 67 Ford GT driver Ryan Briscoe had one of the best suggestions I’ve heard on how to improve the WeatherTech Sports Car Championship: let the all-pro GT Le Mans class go faster, for the good of both the cars and the series. One thing I would love to see in the future, though, is an overall increase in speed for the GTLM cars as a class, because as it is right now, the [pro-am GT Daytona cars] are actually quicker than us on the straights. They out-brake us because they’ve got ABS. The quickest race lap at [Virginia International Raceway] was a [one minute and] 43.8 [seconds] in GTD and we didn’t get out of the [one minute and] 43s. It’s way too close, and there needs to be separation. Briscoe’s memory was a little fuzzy there on lap times, as that 1:43.864 in GTD was set by the No. 48 Lamborghini Huracán GT3 in Practice 3, not during the race. The best in-race lap from that same GTD car there was a 1:45.030. Still, peek at the results for the same race and you can see that the the all-pro GT Le Mans class and professional/amateur GT Daytona cars finish awfully close. Leading pro teams managed 90 laps at VIR, and the pro-am winners did 88. These [GTLM] cars are built to have more power. We’re being held back so much on horsepower. We just need to let the engines run a bit more. These turbos were completely choking on the motor. It’s almost bad for the engine now how little boost we’re running. Running cars closer to their default configuration might have the added bonus of making it easier to spot when a car isn’t performing as it should be, like, oh, the entire GT field did before the 24 Hours of Daytona this year. Perhaps the series could then be more accurate when balancing out the performance of all these different sportscars—something that’s been a major point of contention in sportscars this year. I can’t help but think that there should be another component to Briscoe’s argument, though: slow down the GTD class. At a time when amateurs (who often help fund these pro-am teams) are complaining that GTD cars have become too hard for them to drive in order to remain competitive in the class, enough’s enough. WTSC needs to ensure GTD cars stay easy enough for the necessary moneyed amateurs to handle and in the process, make them slightly slower. Managing traffic is part of the game in multi-class endurance racing, so I doubt a small decrease in speed for the amateurs would change much. Putting amateurs in cars they can handle may even make the racing safer! Most of all, though, it could help prevent other teams from following the GTD-class WeatherTech Porsche’s lead by dropping the series to run somewhere else.